Elite Clinic offers only proven assisted reproduction techniques for infertility treatment and shows very good results in egg donation, embryo adoption and IVF. In total program we guarantee 10 eggs and in partial program we guarantee 5 eggs. Our egg donors suite well to patients from Scandinavia by phenotype and temperament. A recipient can herself choose a donor she really likes. Our IVF laboratory team has remained the same for 15 years – only experienced professionals. Head of Elite Clinic and IVF department Dr Andrei Sõritsa , PhD, is very experienced and well-known IVF specialist. First IVF baby in the Baltic countries was born in 1995 as a result of our team work. The field of infertility treatment in Estonia is regulated since 1997 by a law “Assisted Fertilization and Protection of the Embryo” and Dr Andrei Sõritsa was a part of a workgroup compiling the law. 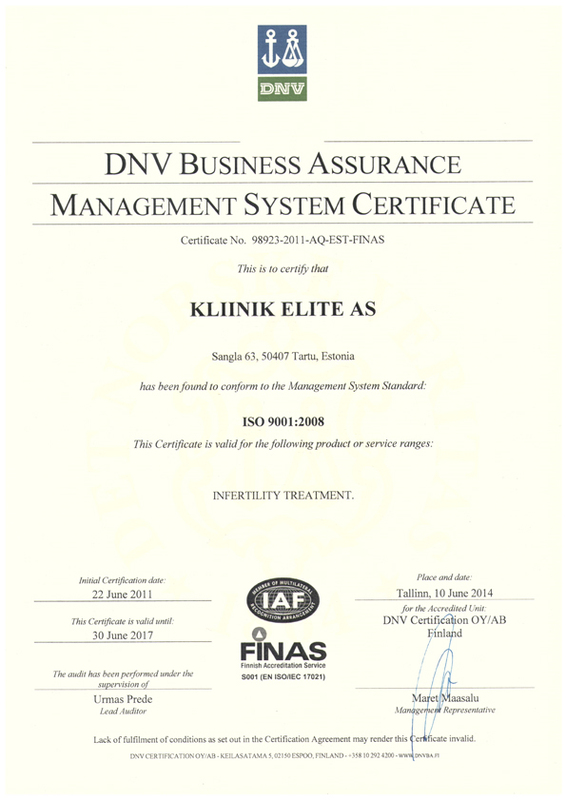 E-mail us at info@elitekliinik.ee for more information and price list. For a free consultation with a fertility doctor send us an e-mail to find out how Elite Clinic can help you to fulfill your dreams.